Most people who visit Angkor Wat don’t realize that Angkor Wat is more than just one temple, albeit the largest and the most fabulous one. 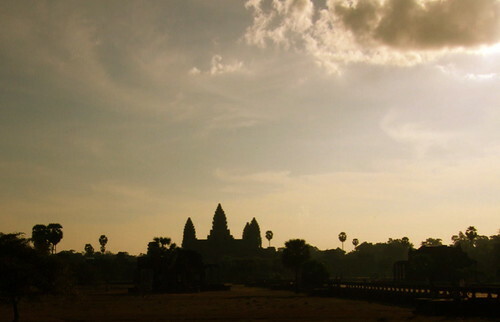 Angkor Wat itself is an ancient city, with the temple at its center. And around it are numerous other ancient cities, temples and reservoirs. In fact the entire metropolis, sometimes referred to as Angkor (which means ‘large’ or ‘great’ in Khmer) is estimated to have had one million people, the first city in the world to reach that plateau. This large population was supported by an extensive network of canals and expansive rectangular reservoirs called barays and smaller reservoirs. The largest barays by far are the West Baray, which doesn’t have water anymore, and the East Baray which is half full. When we went to the top of Bakheng, one of the oldest mountain temples, we could see the East Baray, easily mistaken for a sea because of its large size. Therefore traveling among the temples and cities requires some sort of transportation. Walking between them in the heat and dust is foolhardy. I saw a fair number of bicyclists, but the heat, dust and the chaotic traffic of the narrow roads around the complex would make this miserable. Many tourists came in droves on buses. And there were a good number of cars. But most of us puttered around on tuk-tuks, small open carriages drawn by a moped. They’re hired for the day and are very cheap. Siem Reap is the modern city in which the tourists stay. It’s largely a collection of villages that line the Siem Reap River–each centered around a neighborhood temple, the French Quarter with its old colonial buildings, and Airport Blvd, where enormous resort hotels have sprung up. There are three main markets around the French Quarter. It also has the main restaurant area, so this is where we spent most of the time when not wandering among the ruins. There is currently a construction boom. Numerous hotels and a museum were being built while we visited. The area is vibrant, the people are optimistic. That’s just a rough sketch. The following posts will color it all in with a few more details.